This month has been a whirlwind of events including our flagship health tech event for London Tech Week, which we hosted with Asthma UK, DigitalHealth.London and Tech London Advocates HealthTech group at King’s College London. 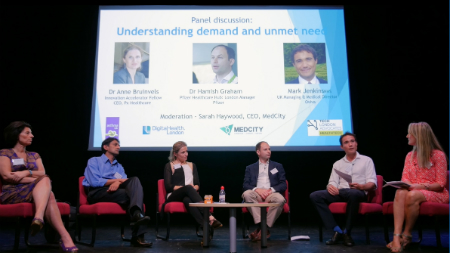 Over 150 people attended to find out about the healthcare demands in London and the funding options available to develop health tech. Download the videos from the day below and take a look at our new funding opportunities pages. Neelam and I have just got back from BIO US in San Diego where we had 121s with lots of companies, I presented on clinical trials going digital, and we had a stop off in Los Angeles to host a mentoring event with the Cedars-Sinai Accelerator Powered by TechStars. We were delighted to support One Nucleus’ seminar at BIO and to join with the BIA and LifeArc at our UK reception. I also took part in an interview on the challenges facing the UK post-Brexit, which, unusually, was held inside a Lamborghini! I’ll share the video by the US Comms agency once it’s out of production. Finally, today we have published our first Annual Review – please take a look at some of the team’s highlights from across the year and get in touch with any feedback. This month’s blog comes from Malcolm Lowe-Lauri, CUHP Executive Director, as he talks us through their five priority areas and the health precinct they are developing. Take a look at what we have been up to over the last 12 months, including personal highlights from the team, and our vision for the year ahead. Who talked Health Tech for #LTW? If you didn’t attend our HealthTech Innovators Conference, or would like to watch again, you can catch up on the panels and presentations from industry, medical researchers, and investors in the videos in our dropbox here. Specialist life sciences crowdfunding platform, Capital Cell, launched in the UK this month, starting their new partnership with Angels in MedCity. To add to the celebrations, they have already been nominated for Best International Growth Business at the UK Business Angels Association Investment Awards 2017. For our London Tech Week event, we collated sources of funding for digital health SMEs – including grants, loans, VCs, Accelerators and additional support – which you can find here. Please let us know if you spot any more that should be on here, to help the digital health community. DigitalHealth.London has interviewed leaders of healthcare organisations across London and asked them why they made the decision to use a digital solution, what benefits they are finding, and how this fits with their vision for the future. They are all captured in this report, which was launched at London Tech Week and NHS Confed17 on 15 June. The next edition of MedCity Update will be sent in July 2017.